Washington State HB 1500 -the Tax Exemption Transparency and Accountability Act of 2017 will have a hearing in the State House Finance Committee on Tues. Jan 31st. Please attend the hearing or comment on the bill on line at www.leg.wa.gov. Action item – Urging your Legislators to pass HB 1500 and companion bill SB 5513 is easy. You can leave them a message by going to www.leg.wa.gov, entering 1500 or 5513 for the bill number after clicking the bill information link and then clicking on “comment on this bill.” Or call the Legislative hotline at 1-800-562-6000 and leave a message to for your legislators and the Governor to support HB 1500 and SB 5513 to create a tax expenditure budget as part of the biennial budget appropriations process. And be sure to thank your legislators if they are a sponsor of this legislation. Their support is appreciated. The Washington State Constitution currently says that a majority vote of our state Legislators is required to pass legislation. That means that 50% of the members of the Washington State House of Representatives and 50% of the members of the Washington State Senate must vote in favor of passing any bill. That includes any bills to raise revenue or repeal a tax exemption or reform our regressive tax system. 50% of the 98 member House is 50 members. 50% of the 49 member Senate is 25 members. On July 3, 2015 Tim Eyman filed with the Washington Secretary of State some 334,000 signatures on Initiative 1366 to the people. Just over 246,000 valid signatures (8% of those who voted in the last Governor’s race) are required to place an initiative on the November general election ballot. So the odds are very high that this measure will be on the November 3, 2015 ballot. Initiative 1366 is an extortion style initiative, proposing to cut $1 billion per year from the Washington State budget unless Legislators by June 2016 place a Constitutional Amendment on the Ballot to require a 2/3 vote of both Houses of the Legislature to raise any tax or repeal any tax exemption. The consequences are staggering if voters pass this measure. Because both Houses of the Legislature would have to pass any bill increasing taxes, as few as 12% of the members of the State Legislature would have the power to overrule a 50% majority vote in both Houses to raise revenue. It may sound enticing to buy Eyman’s libertarian rhetoric to make it harder to raise revenue by requiring a 2/3 vote of both Houses. But this means that only 1/3 of the Legislators in either the House or the Senate is all that’s required to kill a bill to raise revenue. The House has 98 members. That means a minority voting block of only 34 House members (or 23% of all Legislators) could kill revenue bills or a budget raising new revenue. The Senate has 49 members. A 1/3 minority voting block of 17 Senators (or 12% of all Legislators) could kill any bill that increased revenue. Since a vote to kill any revenue increase under Eyman’s proposed Constitutional amendment would require a 2/3 vote in both Houses, a minority caucus of only 17 anti tax Senators out of 49 voting NO would prevent passage of any tax or revenue increase bill. 17 Senators out of a total of 147 Legislators in both Houses is equal to only 12% of the State Legislators. This is the dirty little secret that Eyman and his anti-tax large funders do not want the public to understand – that I-1366 would turn over the tax setting authority of the state to only 12% of our state Legislators. This is a much easer number of Legislators for Big Oil and Big Corporations and other special interests to elect to office than 50% of our state Legislators. It is much easer for them to convince only 12% of the state legislature to vote NO on closing tax loopholes than 50%.. The consequences of overturning majority rules and imposing Eyman’s minority rules are mind boggling. To go from 50% of Legislators required to pass a revenue bill to allowing 12% of the legislators to prevent passage of a revenue bill would turn democratic rule on its head and give unprecedented power to a tiny group of Legislators. This is totally contrary to the idea of proportional representation and elected Legislators of the state having the power to make decisions by majority votes, including tax and revenue issues. The founders of our Federal Government very clearly stated the danger of requiring more than a majority of Legislators to pass legislation. The drafters of the Washington State Constitution also reached the same conclusion – that any so called “supermajority” voting requirement to overrule the will of a majority would allow for a tyranny of a minority. Eyman’s proposed constitutional amendment would end majority rules for voting that is in our state constitution and replace a requirement for 50 % majority votes in both Houses with “Rule by the 12%. Say NO to Eyman’s latest folly by voting NO on Initiative 1366 on November 3, 2015. The Washington State Democrats have urged voters to reject Initiative 1366. At their April 12, 2015 meeting in Pasco Washington they passed a resolution opposing Tim Eyman’s Initiative 1366. Initiative 1366, according to a May 17, 2015 Seattle Times article is expected to be on the Nov 2015 ballot. 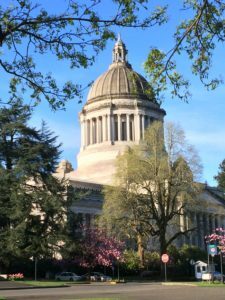 “Buoyed by new wealthy patrons, Eyman’s Initiative 1366 — which would punch a $1 billion a year hole in the state budget unless lawmakers refer a tax-limiting constitutional amendment to voters — looks well on its way to the November ballot. Initiative 1366 adopts Senator Ted Cruz Tea Party style tactics, using extortion tactics to try to impose minority rule over Washington State’s budget and revenue policy. Its purpose is to slash a billion dollars a year from the Washington State budget unless Washington State Legislators place a constitutional amendment for 2/3 votes to raise revenue or repeal tax exemptions on the ballot. The Washington State Constitution says only Legislators have the power to place a constitutional measure on the ballot by a 2/3 vote of both houses. The same 2/3 threshold Eyman is trying to impose for raising revenue he is iunable to convince legislators to do for a constitutional amendment. So he is resorting to extortion and bullying tactics. Who loses are the children in our state if revenue is cut $1 billion/yr. How can a majority vote compel a 2/3 vote? This is most likely an unconstitutional abuse of power and not legal. Voters should just reject such extortion style tactics. At a special hearing in Olympia representing Washington residents from all 49 legislative districts on May 4, 2015 the voices were loud and clear about the need for tax reform. Washington State for a number of years has earned the unfortunate distinction of being the most regressive state in the country in terms of state and local taxes. The Institute on Taxation and Economic Policy noted that the poorest 20% in Washington State paid 16.8% of their income in state and local taxes while the richest 1% paid only 2.4%. “Washington’s outdated and unfair tax structure is in dire need of a makeover,” said Senate Democratic Leader Sharon Nelson, one of more than a dozen Democratic lawmakers who were in attendance for Monday’s hearing. “It is unconscionable to continue to prop up a system that asks more and more from people who are barely getting by, while at the same time giving away millions in tax breaks and asking for very little from the super wealthy. We’re not trying to punish anyone, but it’s not unreasonable to ask those who have been very financially successful to pay their fair share. Unfortunately for most of the last 20 years Washington State was operating under legislation passed by voters that in 2013 was ruled unconstitutional by the Washington State Supreme Court – namely the requirement started under Initiative 601 and continued by initiatives put on the ballot by Tim Eyman and approved by voters that any legislation to raise revenue or repeal tax exemptions required a 2/3 vote of both houses of the Legislature. Under these initiatives unfortunately any tax reform that happened, even a revenue neutral one to make our taxes less regressive, required a 2/3 vote because any tax “increase” required a 2/3 vote even if overall the change was revenue neutral. Unfortunately the Republicans took over the Senate in Washington State in 2013 and they have continued to oppose efforts to raise revenue or institute tax reform to change Washington State’s regressive tax system. Initiative 1366 is Tim Eyman’s 2015 initiative campaign to protect the wealthy and corporations in Washington State. It is both an appeal to greed and a guaranteed way to prevent reforming Washington State’s regressive tax system. Initiative 1366 is an extortion style measure designed to fulfill an Eyman dream – to force the Washington State Legislature to place a constitutional amendment before the voters to allow a minority of one third of the Legislators in one house of the Legislature to prevent raising any new revenue or repealing any tax exemptions. “In a landmark ruling 20 years in the making, the Washington State Supreme Court this morning struck down Initiative 1053 as unconstitutional. The court majority said the constitution controls the majority needed for tax hikes and the constitution requires only a majority of the members of the House and Senate. Unfortunately for Eyman in an ironic twist, under the Washington State Constitution requiring a 2/3 vote by the Legislature to propose a constitutional amendment, Eyman is unable to muster a 2/3 vote. So Eyman is trying to force the Legislature to act. He is using extortion tactics reminiscent of Senator Ted Cruz. The Washington State Supreme Court in it’s McCleary decision said the state was shirking its constitutional responsibility by not adequately funding public education. Eyman’s I-1366, rather than moving the state forward, proposes to blow a big hole in the ability of the state to perform it’s constitutional responsibilities. I-1366 proposes to cut the state sales tax from 6.5% to 5.5% decreasing state revenues by $1 billion per year unless the Legislators comply with Eyman’s demands. and put a constitutional amendment on the ballot. Besides this immediate impact if voters approve I-1366 and don’t act on Eyman’s demand for a 2/3 vote on a 2/3 constitutional amendment, a 2/3 vote requirement in the Constitution would permanently change the way the Legislature functions by turning revenue decisions over to a minority 1/3 faction of the legislature to overturn any decision by a majority vote to raise revenue or repeal tax loopholes. In a bizarre twist it would allow a majority vote to enact or extend tax exemptions but require a 2/3 vote to repeal them. Tim Eyman is busy collecting signatures by paid canvassers to place Initiative 1366 on the November 6, 2015 ballot. He has until July 2, 2015 to collect a minimum of 246,372 valid signatures. Do not sign I-1366 and if it gets on the Nov. 6th ballot Vote NO. Don’t turn our Legislature over to special interests, the wealthy and Big Corporations.